Instrotech is offering the Kobold electromagnetic inductive flowmeter for conductive fluids – the model DMH – with a standard accuracy of ± 0,3% of reading stability of zero. It is used specifically for the measurement and monitoring of the volume flow rate of potable (drinking) water, waste water, acid or alkaline fluids, pulps, pastes and other electrically conductive materials, without loss of pressure. When an electrically conductive medium passes through a directional magnetic field, a voltage is induced in accordance with Faraday’s Law of Induction. The size of this measurement voltage is proportional to the mean rate of flow and consequently also to the volume flow rate. A flowmeter consists of a sensor that picks up the measuring signal generated from the induced voltage, and a transducer that converts this signal into a standardised output signal (4-20 mA or pulses). 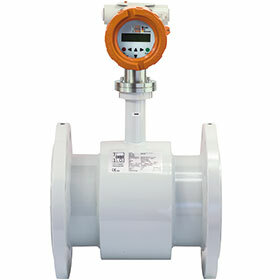 The measurement transducer can be affixed to the sensor or mounted separately. Pressure, temperature, density and viscosity do not affect the volume measurement. Solid fractions and gas bubbles should be avoided. The microprocessor-controlled UMF2 converter guarantees the highest of accuracies, and with its alphanumeric backlit LCD terminal, six keys, plain text response and plausibility check of entries, it is very easy to operate. Empty pipe detection, coil current monitoring, and plain text error messages guarantee full control over the sensor and measuring point at any time. Pulse, status and current outputs, as well as HART communication are standard features, all of them electrically isolated. Lining materials such as hard rubber, soft rubber, PTFE or PFA are available. A wide range of standard and special electrode materials are on offer, including Hastelloy, platinum and tantalum. The DMH is available for a nominal width of DN10 ... DN1200 and flow velocities up to 10 m/s.